Hard to believe, but Wordplay is now in its ninth year on the air at WJCU. The show has evolved into an offbeat mix of poetry, comedy, and an ongoing exploration of the possibilities of the spoken word. Wordplay's opening monologue blends music and language (and sometimes sound effects) into a surreal, funny, often darkly serious meditation on the state of one man's struggles to live in the bewildering world of contemporary America. The show also features guest appearances by local poets such as Ray McNiece, Mary Weems, Michael Salinger, Katie Daley, Jack McGuane, Gail Bellamy, and dozens of other interesting voices. And nationally known writers like Billy Collins, Robert Pinsky, Rita Dove and Paul Muldoon have performed on the show in connection with their readings at John Carroll University. 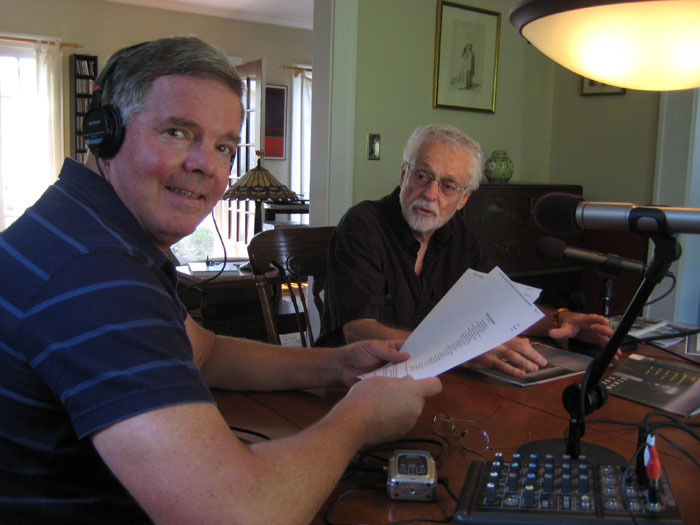 But the real strength of Wordplay is the interaction between co-hosts George Bilgere and John Donoghue. The two poets read short, interesting poems by important writers. They banter about poetry, argue about it, and generally give each other a hard time. A Plain Dealer article about Wordplay called the show "the Click and Clack of poetry." Not a bad description. Visit the archive to hear it for yourself! George Bilgere teaches in the English Department at John Carroll University in Cleveland. He's been writing poetry for many years, and also does freelance radio pieces for local and national NPR stations. So doing a show like Wordplay lets him combine two of his greatest interests, poetry and radio. His most recent books are The White Museum (Autumn House Presss) and Haywire (Utah State University Press). Garrison Keillor often reads George's poems on the daily NPR radio show, The Writer's Almanac. For more about George, check out his website at georgebilgere.com. John 's poetry has appeared in numerous journals, and his two books are Precipice and A Small Asymmetry. He has paid the bills not as you might think from the earnings of these books, but by teaching electrical engineering at Cleveland State University, where he is an Associate Professor. Before that he worked in industry as a control engineer for the Industrial Nucleonics Corporation. When it comes to poems for Wordplay, he likes the strange, the funny, occasionally the moving and the dark, but most of all a poem must be "radio ready", not one so long and dense that listeners start banging their heads against walls, driving their cars into poles, or, the worst, turning to other stations.